Editors' Note: This article received the Pioneer Award from the Science Fiction Research Association for the best critical essay on science fiction published in 1997. Only the most perverse would reject the proposition that an evolutionary process of challenge and response has controlled and directed the tale of the war-to-come ever since that far-off day in 1644, when the citizens of London first had sight of a six-page fantasy about the Civil War then raging in England. This was Aulicus his Dream of the Kings Sudden Comming to London--a primitive thing, filled with passion recollected in tumultuous disquiet. The author was Francis Cheynell, who was notorious enough to secure a minor place in the Dictionary of National Biography, where he appears as a Puritan fanatic well known for his detestation of Charles I and all he represented. Cheynell is the first dreamer in futuristic fiction. He relates how he fell asleep afflicted by thoughts of the Civil War, and in a protracted nightmare he has a fearful vision of King Charles triumphant over Cromwell and the forces of Parliament. That political fantasy had bite in the May of 1644, when it was still thought possible that the king could prove the victor in the Civil War. With that in mind Cheynell did what so many would go on doing long after him. Within the limitations of six pages he told his tale of the disaster-to-come as dramatically as he could, so that readers would have no doubt that the meaning of his message was: ACT NOW BEFORE IT IS TOO LATE. Few followed where Cheynell had boldly gone. For two and a quarter centuries after the appearance of Aulicus his Dream, the history of future-war fiction was a series of occasional and usually most unremarkable stories--so few in number that a modest brief-case could contain them all.1 And then quite suddenly the great powers of the press, politics, and population came together in 1871, when Chesney's Battle of Dorking touched off the chain reaction of future-war stories which continued without cessation until the outbreak of the First World War. From 1871 onwards not a year went by without the appearance of a tale of the war-to-come in Britain, France, or Germany. At times of major anxiety--the Channel Tunnel panic in 1882, the Agadir Crisis of 1911, for instance--they appeared by the dozen; and the probable total for the period from 1871 to 1914 is not less than some four hundred stories in English, French, or German. Those languages point to a massive European interest in The Next Great War, der nächste Krieg, La Guerre de demain, as they called it in the cheerful language of anticipation. Their tales of the war-to-come were joined together in an unholy marriage of conflicting interests. They owed the origin, the circumstances and the consequences of their projected conflicts to the Other. Locked in a necessary and unloving embrace with tomorrow's enemy, they found complete justification for their narratives in the often repeated claim that their future war would be the next phase in the history of their nation. As these tales of the war-to-come grew in numbers from the 1880s onwards, the range of their preoccupations expanded so that by the end of the 19th century a paradigm of military and political posibilities had come into existence both in Europe and in the United States. At the far-out paranoid end there were the total fantasies of the Yellow Peril, of Demon Scientists and Anarchists, all armed with the most fearful weapons conceivable and all hell-bent on taking over the world. These all require, and may yet obtain, their own separate assessments; but for the present it is enough to say that the Yellow Peril was one theme the Europeans had in common with the United States. As Bruce Franklin has shown in War Stars (pp. 33-45), the American versions began with Pierton Dooner's Last Days of the Republic in 1880, and within two decades they had become a flood. During that time the Europeans did almost as well: Jules Lermina in La Bataille de Strasbourg (1895) described how a scientist blows up Mont Blanc and destroys the invading Asiatics; the British writer, M.P. Shiel, dealt with the Chinese attempt to conquer the world in The Yellow Danger (1898); and the Asians were still on the move in 1908 in Bansai!, a German account of a Japanese attack on the United States by Parabellum (Ferdinand Heinrich Grautoff). These were future-war themes taken to the limit. They had no immediate and substantial links with the contemporary world situation, as Capitaine Danrit made clear when he dedicated his three-volume tale of L'Invasion noire (The Black Invasion, 1895-6) to Jules Verne. He wrote that his account of a future invasion of Europe--by hordes of fanatic African Muslims led by a sultan of genius-- ``...depended on a very questionable proposition, since the reverse is happening in our age. The European powers are carving up the Dark Continent as they like, and they are distributing the primitive populations amongst themselves as if they were cheap livestock'' (2). That uneasiness with European colonialism was the trigger for an imaginary eruption of overwhelming forces--Chinese, Japanese, Africans--who play their own imperial power-games with the Western world. The contemporary versions of the ``Bad American Dream,'' for example, clearly derived from subliminal anxieties about the ``enemy within'' in King Wallace's The Next War: A Prediction (1892), and from American anxieties about the new Japan in J.H. Palmer's The Invasion of New York; Or, How Hawaii was Annexed (1897). For those who had the courage of their racial prejudices, however, there was a final solution for the nightmare from the East--wipe out the inferior races. ... a rain of death to every breathing thing, a rain that exterminates the hopeless race, whose long presumption it had been, that it existed in passive prejudice to the advance of United Man. These extreme fantasies derived from the ceaseless dialogue between Western culture and the immense, ever-growing powers which the new industrial societies had generated since that day on Glasgow Green in 1764 when James Watt got the idea for the separate condenser. One hundred years later Jules Verne began his most profitable career as the first great writer of science fiction by demonstrating the most desirable applications of the new technologies in the achievements of Nemo, Robur, and the Baltimore Gun Club. And then in Les 500 Millions de la Bégum (The Begum's Fortune, 1879) he looked at the morality of intentions in the use of scientific knowledge. Franceville is the ideal city, dedicated to peace, the happiness of its citizens, and the good of humankind; Stahlstadt is the dark opposite, the home of Dr Schulze and his super-gun--totalitarian, regimented, bent on the conquest of the world. The unwritten conclusion was that, given sufficient power, anyone--any nation, any group, any race--could take control of planet Earth. No one put this better than H.G. Wells in the most telling and most effective of all future-war stories, The War of the Worlds (1898). In that classic tale Wells began with the notion of superior force, as it had been suffered by the Tasmanians who ``...in spite of their human likeness, were entirely swept out of existence in a war of extermination waged by European immigrants in the space of fifty years.'' When the Martian cylinders land on the common between Horsell and Woking, the rifles and artillery of the British prove as useless as the wooden clubs of the Tasmanians. The super-weapons of the Martians--all the fire-power and mobility any general could desire--were warning images of what science might yet do for the military. This discussion of military power provided abundant material for a parallel sequence of more conventional tales about ``What It Will be Like in The Sea Warfare of Tomorrow.'' These were a straightforward form of future-war fiction--all the fighting without the politics--for the narratives concentrated almost entirely on the operations of naval vessels. They were written as answers to serious questions prompted by the coming of the ironclad warship, by the introduction of the ram, and by the development of the destroyer and the submarine. And here again national interests decided the distribution of these stories. British writers dominated the field for the good reason that the Royal Navy was the first line of national defence for the United Kingdom.4 German writers were conspicuous by their absence. They had nothing to write about, since the new Reich did not start on a naval building programme until the first Navy Law of 1898. The French were more interested in, and wrote more about, their army; and across the Atlantic, as Bruce Franklin has demonstrated in War Stars (23-33), American propagandists were turning out preparedness tracts to present the case for the great navy that the United States did not have in the 1880s. One of the best examples of this anticipatory fiction came from the British Member of Parliament, Hugh Arnold-Forster, later Secretary of the Admiralty. He wrote his tale of a ramming action, In a Conning Tower: A Story of Modern Ironclad Warfare (1888), in order to give his readers ``a faithful idea of the possible course of an action between two modern ironclads availing themselves of all the weapons of offence and defence which an armoured ship at the present day possesses''(ii). It proved most popular: after appearing in Murray's Magazine (July 1888), the story went through eight pamphlet editions, and there were translations into Dutch, French, Italian, and Swedish. There was a comparable interest in Der grosse Seekrieg im Jahre 1888 (The Great Naval War of 1888), written by Spiridion Gop evi , an officer in the Austrian Navy. His elaborate account of naval tactics in a war between the British and French first appeared in the highly professional Internationale Revue über die Gesamten Armeen und Flotten in 1886, and in the following year the story went into an immediate English translation as The Conquest of Britain in 1888. The evident popularity of these various tales of the war-to-come marks a sudden and extensive change in long-established modes of communication. Almost overnight fiction had replaced the tract and the pamphlet as the most efficient means of airing a nation's business in public. For centuries ``the address to the nation'' had done good service in warning of the dangers-to-come--from the first signals of alarm at the coming of the Invincible Armada in 1588 to the outpouring of pamphlets that accompanied, and often profoundly influenced, the course of events in the United States in 1776, in France in 1789, and in Great Britain during the time when the Armée de l'Angleterre was waiting in Boulogne to start on the invasion of England. Although the undisputed effectiveness of Chesney's Battle of Dorking was a most potent force in encouraging this shift into fiction, the prime movers in the great change were a combination of social and literary factors. First, there was the matter of demand and supply: the constant growth of populations and the parallel rise in the level of literacy provided more and more readers for the increasing numbers of newspapers, magazines for all interests, and books of every kind. Second, a new and most influential conclave of historians demonstrated, often with great eloquence, how their nations had secured their place in the nineteenth-century world. So, an exclusive sense of nationhood fed on and grew out of the new histories, which were the life-work of eminent writers like Guizot, Thierry, Michelet, Francis Parker, Macaulay, Carlyle, Buckle, von Ranke, Treitschke. In keeping with the general belief in ``progress,'' they explained the evolution of their nations as the work of exceptional individuals and the result of communal movements, of struggles with other nations, and of decisive victories at Austerlitz, Saratoga, and Waterloo. The new, centralised systems of education passed on their simplified versions of one-history-for-one-people to the state schools, so that by the 1890s the young in all the major technological nations had received an appropriate grounding in the received history of their country. Again, and for the first time in human history, the young could see the evolution of the nation state in the maps that showed the unification of the German states, or the advance out of the thirteen colonies westward towards the Pacific, or the lost provinces of Alsace-Lorraine, or the many additions to the British Empire. In the parallel universe of the new historical fiction, the heroic individual had his appointed role in the male worlds of Walter Scott, Victor Hugo, Fenimore Cooper, Alessandro Manzoni, and many others. In their various ways they sought to reveal the intimate links between character and action, between the person and the nation. And so, in January 1871, when Chesney was considering what would serve him best as a model for the tale about a German invasion he had contracted to write, he thought immediately of fiction in the style of Erckmann-Chatrian. Those two most popular writers had set their tales about the ``Conscript'' in the well-established circumstances of the Napoleonic Wars. Their handling of their stories was an ideal example for a British colonel who wished to show that the projected events in his history of the coming invasion would follow from the faults and failings of the nation in 1871. These errors of the past--so evident, so avoidable, so serious--gained a powerful psychological spin from a future history that could handle disaster or victory with equal facility. The time-frame recorded events as a chapter, often the last chapter, in the national history: victory happily and gloriously confirmed the national destiny; and defeat allowed for telling contrasts between the final disaster and the better days gone beyond recall. You ask me to tell you, my grandchildren, something about my own share in the great events that happened fifty years ago. 'Tis sad work turning back to that bitter page in our history, but you may perhaps take profit in your new homes from the lesson it teaches. For us in England it came too late. And yet we had plenty of warnings, if we had only made use of them. The danger did not come on us suddenly unawares. It burst on us suddenly, 'tis true, but its coming was foreshadowed plainly enough to open our eyes, if we had not been wilfully blind. The pages of universal history may be scanned in vain for a record of disasters, swifter in their coming, more destructive in their scope, or more far-reaching in their consequences, than those which befell the United States of America in the last decade. Standing on the threshold of the twentieth century, and looking backward over the years that have passed since the United States first began to realize the tremendous possibilities of the impending crisis, we are amazed at the folly and blindness which precipitated the struggle, while bewildered and appalled by its effects on the destinies of mankind. In 1891 we behold a nation! A Republic of sixty-two million ... an intelligent, refined, progressive people; peace and plenty within their borders from the Atlantic to the Pacific, and from the shores of the Great Lakes to the Gulf. In 1892, we see the shattered remnants of the once great Republic. We read with tear-dimmed eyes of its tens of thousands of heroes fallen in defence of its flag, of its thousands of millions of treasure wasted in tardy defence, or paid in tribute to the invader. It was standard practice to start from established positions in the political geography of Europe or of the United States. The French, for example, saw a war with Germany and the recovery of Alsace-Lorraine as no more than patriotic duty. That agreeable prospect provided cause and consequence for a succession of anticipations that began in the year of defeat with: Edouard Dangin, La Bataille de Berlin en 1875 (The Battle of Berlin in 1875, 1871). That theme reappeared five years later in Anonymous, France et l'Allemagne au printemps prochain (France and Germany Next Spring, 1876); and again in 1877 in Général Mèche, La Guerre franco-allemande de 1878 (The Franco-German War of 1878). These were the first in an ever-growing flood of these guerres imaginaires that reached the highest-level mark in the many publications of Capitaine Danrit (Commandant Emile Augustin Cyprien Driant, 1855-1916). He belonged to the new fraternity of senior officers--patriot writers to the public--who chose to make their appeals to the masses through the medium of fiction; for they knew from the success of Chesney's Battle of Dorking that a tale of the war-to-come, fought against the expected enemy, was the most effective means of putting the case to their citizen paymasters for more funds for more troops and for more warships. Commandant Driant was an eminent person, like so many of the authors who wrote future-war stories before the journalists of the new mass newspapers took over from them about the turn of the century. He was commissioned into the infantry and after eleven years of service with the colours he was appointed adjutant to General Boulanger at the Ministry of War in 1888. In that year the general's political activities led to the removal of his name from the army list and in that same year Driant married the general's youngest daughter and began work on his first guerre imaginaire. The distinguished record continues: instructor at St. Cyr; battalion commander by 1898; resigns commission in 1906 and goes into politics as the deputy for Nancy; dies a hero's death on the Verdun front in 1916. And his voice trembled with emotion as his finger pointed in the direction of Metz. By 1913 Driant had published so much fiction, and his stories were so long that half a century later Pierre Versins felt called on to protest in the name of sanity. The hundred pages of Chesney's Battle of Dorking, said Pierre Versins in his admirable Encyclopédie, were far more important and revealing ``than the thousands of white pages soiled day after day by a national hero of France (they dedicated a postage stamp to him in 1956). Thousands? Judge for yourself! A comparable association between the British public and the military can be examined in the ways General Sir William Francis Butler (1838-1910) and his wife exploited the general interest in warfare. He had distinguished himself in various colonial operations--the Ashanti campaign, the Zulu War, Tel-el-Kebir--and he went on from one senior post to another, and ended his career as a lieutenant-general in 1900. In between campaigns he found time to make his contribution to the growing literature of future warfare with The Invasion of England (1882), a variant on an already well-established theme. His wife, however, was far more famous. The battle-paintings of the celebrated Lady Butler were reported at length in the Press; they attracted huge numbers of viewers whenever they were shown at the Royal Academy; and the editors of the principal illustrated magazines spent thousands of pounds to secure rights of reproduction. When her paintings went on tour, it was reported that viewers queued for hours. The showing of the famous painting of Balaclava, for instance, attracted some 50,000 at the Fine Art Society in 1876 and when it arrived in Liverpool, more than 100,000 had paid to see the picture. The French had created their own heroic iconography out of their exceptional military history. A succession of gifted painters--Horace Vernet, Adolphe Yvon, Alphonse de Neuville, Edouard Detaille, and the incomparable Jean Louis Meissonier--revealed the supreme moments of victory and defeat. To look backward was to see the glorious past, battle by battle, and one great warrior after another, as they appear to this day in the ``Salle des Batailles'' at Versailles. To look forward to the war of the future, however, required gifts of imagination that were peculiar to only one man. Albert Robida (1848-1926) was the Jules Verne of the sketch pad and the magazine drawing. The two men quarried from the new technologies for their vision of things-tocome; and both had their base in the new magazines--for Verne the Magasin d'éducation et de récreation; for Robida his own La Caricature. Where Verne was all high seriousness in his stories, Robida was relaxed and amused at the images that came to him out of the future. He looked into the twentieth century in his Le Vingtième Siècle (The Twentieth Century, 1883) and found a world where the droll, whimsical images confirmed the fact of progress and universal prosperity: air taxis, aeronefs-omnibus, transatlantic balloons, aerial hotels, apartment blocks made from compressed paper, television for all, synthetic foods, submarine cities, underwater sports, and a women-only stock exchange. Robida was the Lone Ranger in the French guerres imaginaires: one of the very few (like A.A. Milne and P.G. Wodehouse) who found it possible to be funny about ``the next great war.'' He rescued his comic tale from the Bastille of real events, because he was able to ignore contemporary politics, unlike the hundreds of earnest writers--British, French, and German--for whom the tale of the European war-to-come was a desirable extension of national policy by means of fiction. For that reason these tales often sold well, and went on selling in sudden bursts of popularity whenever some perceived danger attracted the attention of a nation. In 1882, for instance, the proposals for the construction of a Channel Tunnel set the alarm bells ringing in the United Kingdom; and, as the arguments against so imprudent, so perilous a connection with the Continent went the rounds of the Press, anxious patriots took to writing fearful tales that promised the worst in their titles: The Seizure of the Channel Tunnel, The Surprise of the Channel Tunnel, How John Bull Lost London, The Siege of London, The Story of the Channel Tunnel, The Battle of Boulogne. The best of these was the work of Howard Francis Lester, a barrister and an eminent person in the British legal system. In The Taking of Dover (1888) he told a tale of French treachery--of French assault troops hidden in Dover, waiting for the day when they could emerge to seize the town and begin the invasion of England. The tale, slotted into an appropriate place in French history, is told after the conquest by the commander of the assault troops who shakes his head with great effect at his recollections of British folly and unpreparedness. It seemed only yesterday they were plotting the seizure of Dover, and now he could not ``but pity the nation; but their humiliation, as it was occasioned by sheer recklessness, by avarice for the gains of trade, and by blind stupidity, appears to my judgment to have been fully deserved'' (11). Quick-firing rifles, enormous guns, improved shells, smokeless and noiseless gunpowder--these are so destructive that a great battle (such as there never will be, we hope) could cause the deaths of 300,000 men in a few hours. It is evident that the nations, no matter how unconcerned they may be at times when driven by a false pride, will draw back before this terrible vision. That bid to increase the print run of a new magazine marked the beginning of a new trend in the Press. The war-to-come had moved out from its original base in the middle-class journals and had become a valued commodity for the mass-circulation magazines and newspapers that began to appear in the 1890s. Thus, the editorial hand can be seen at work in the presentation of the story. One major innovation showed in the realism and careful attention to detail in ``the scene of action'' style of the narrative. This was most evident in the up-to-the-minute accounts that told the tale in a sequence of dated reports from the front, telegrams from correspondents with the combatants, and editorial comments in the manner of contemporary newspapers. Another innovation in this search for the authentic appeared in the frequent first-class action illustrations--the work of outstanding contemporary war artists who sought to give the impression of on-the-spot photography. Again, the members of the writing team represented an array of the major talents. The co-ordinator was the distinguished naval officer, Rear-Admiral P. Colomb, known as ``Column and a Half'' from his habit of writing long letters to the Times. He contributed the naval episodes, and he edited the land warfare accounts from Charles Lowe, a distinguished foreign correspondent of the Times, and Christie Murray who had been the special correspondent of the Times during the Russo-Turkish War of 1877. The great war of 189- begins in the Balkans, in keeping with general expectations; and the immediate cause proved unusually prescient--the attempted assassination of Prince Ferdinand of Bulgaria. The ultimate cause--a preview of 1914--is the chain-effect of the Triple Alliance between Germany, Austria-Hungary, and Italy. The action begins with the Serbian attack on Bulgaria. The Austrians occupy Belgrade as a precautionary move; and in response the Russians occupy the principal Bulgarian ports on the Black Sea. Germany mobilizes in support of Austria-Hungary; the French rally to Russia and declare war on Germany. The United Kingdom begins by keeping to the traditional policy of ``glorious isolation,'' but is eventually drawn into the conflict against the French and the Russians. Well-known contemporary personalities--political, military, naval--play their parts in this drama of the expected. There are various major engagements on land and sea, most of them one-day affairs, in a war of rapid movement with infantry advancing at the double and grand cavalry charges. There are no long casualty lists; all combatants behave like gentlemen; and the war is over by Christmas. From 1890 onwards the tale of the war-to-come adapted to the new circumstances of an ever-growing demand from the burgeoning popular press. Editors began to commission tales of ``the next great war.'' One of the first into the new business was that astute entrepreneur, Alfred Harmsworth. He began a most profitable association with the sensational writer, William Le Queux, when he commissioned a future-war story for his new tabloid, Answers. This was The Poisoned Bullet, a tale of a Franco-Russian invasion, which ran for six months and ended on 2 June 1894. The yarn went on to even greater success. When it was later published as a book with the title of The Great War in England in 1897 (1894), it ran through five editions in a month, and attracted attention in France, Italy, and Germany. Twelve years later Harmsworth (by then elevated to Viscount Northcliffe) made the newspaper coup of the pre-1914 period. In 1906 he commissioned Le Queux to write a serial, The Invasion of 1910, for his tabloid Daily Mail. The story did wonders for the circulation figures of the newspaper. It made a small fortune for Le Queux; there were translations into twenty-seven languages, and over one million copies of the book edition were sold. How the People of All the Earth, Fearful of a Second Invasion from Mars, Under the Inspiration and Leadership of Thomas A. Edison, the Great Inventor, Combined to Conquer the Warlike Planet. By the end of the century the tale of the war-to-come had clearly become a thriving business that responded to the very different interests of two sets of readers. In the universe of serious politics and national defence the short storydeclined in numbers and vanished from all but the most prestigious magazines, like the Strand and McClure's Magazine; but the lobbyists for preparedness continued with their messages, working more effectively in long stories that often ran to many editions. In the newer universe of the fancy-free—those who followed conjecture wherever it led—there were no limits to their fantasias of the future. One favoured theme was the scientist of genius and his invention of the superweapon; and here the delightful excitement that powered these hectic dramas of the boundless—dynamite ships, immense flying machines, super-bombs—tends to obscure the beginnings of a confrontation between science and society. Is there evil but on earth? or pain in every peopled sphere? Well be grateful for the sounding watchword `Evolution' here. And Reversion ever dragging Evolution in the mud. Jules Verne in his old age, like Tennyson, revised his ideas about the gifts of science. In Face au drapeau (Face the Flag, 1896) the invention of the super-bomb, the Fulgurator, is the occasion for weighing scientific achievement in the scales of good and evil. Verne went further in his Maître du monde (Master of the World, 1904), where Robur reappears--an Edison gone wrong--as a danger to the world. In like manner, the bad genius, ``a mad genius in charge of a new and terrible explosive,'' dominates the action in Robert Cromie's The Crack of Doom (1895). He has discovered that ``one grain of matter contains enough energy, if etherized, to raise one hundred thousand tons nearly two miles'' (36). He sets out to destroy the world, but fortunately a prototype James Bond defeats him at the last moment. Good scientists came singly or in groups. The example of Ferdinand de Lesseps, for instance, offered the French ideas for turning the tables on their hereditary enemy. In George Le Faure's Mort aux Anglais! (Death to the English!, 1892) the good French patriot and man of genius devises yet another perfect scheme to defeat the British: reverse the Gulf Stream and freeze them out! An even more ingenious variant on that notion comes from Alphonse Allais who devotes the aptly named Projet d'attitude inamicale vis-à-vis de l'Angleterre (Plan for Hostile Relations against England, 1900) to a plan for freezing the Gulf Stream. The Channel then ices over ten feet deep and the French march across to final victory. When Wells was engaged on his Anticipations in 1901, he saw no connection between the Navy Law of 1898, which began the construction of a large German navy, and the increased possibility of a great European war. The first signs of a possible Anglo-German confrontation, however, had already appeared in: T.W. Offin, How the Germans took London (1900); and in Karl Eisenhart, Die Abrechnung mit England (The Reckoning with England, 1900). The German writer describes the war-to-come against the United Kingdom; and he begins by saying that ``The entire Navy had long yearned for the Day when they could take on the hated English; for they had brought on themselves immense hatred and an animosity like that which the French had experienced in 1813. ''16 That was the signal for a great outpouring of tales about the coming war between the British and the Germans. For the following fourteen years, British writers described a German invasion of England in tales like: The Invaders, The Invasion of 1910, The Enemy in our Midst, The Death Trap; and German writers gave their version of der nächste Krieg in their visions of: Der Weltkrieg: Deutsche Träume, Die `Offensiv-Invasion' gegen England, Deutschlands Flotte im Kampf.17 All these essays in future-think had two things in common: the authors expected a war between the Imperial Reich and the United Kingdom; and in their descriptions of naval and military engagements they failed entirely to foresee the new kind of warfare that began in the autumn of 1914. 1. For a survey of early future-war stories, see I.F. Clarke, ``Before and After The Battle of Dorking,'' SFS, 24:34-46, March 1997. 2. Jack London, ``The Unparalleled Invasion,'' Excerpt from Walt. Nervin's ``Certain Essays in History,'' McClure's Magazine (July 1910), 308-14 and reproduced in: I.F. Clarke (ed), The Tale of the Next Great War, 1871-1914 (Liverpool: Liverpool UP, 1995), 265. 3. Ibid., 269. London's story has been chosen as one of the texts to be used by students of English in the Central China Normal University at Wuhan, Hubei, People's Republic of China. 4. These British naval stories became a flood in the 1890s--an effect of the interest in many new types of warship and of the increasing tension between the United Kingdom and France, the only comparable naval power at that time. The major stories were: William Laird Clowes, The Captain of the``Mary Rose,'' 1892; A.N. Seaforth (George Sydenham Clarke), The Last Great Naval War, 1892; Captain S. Eardley-Wilmot, The Next Naval War, 1894; The Earl of Mayo, The War Cruise of the Aries, 1894; J. Eastwick, The New Centurion, 1895; F.T. Jane, Blake of the ``Rattlesnake,'' 1895; Francis G. Burton, The Naval Engineer and the Command of the Sea, 1896; H.W.Wilson and A. White, When War breaks out, 1898; P.L.Stevenson, How the Jubilee Fleet escaped Destruction, and the Battle of Ushant, 1899. 5. 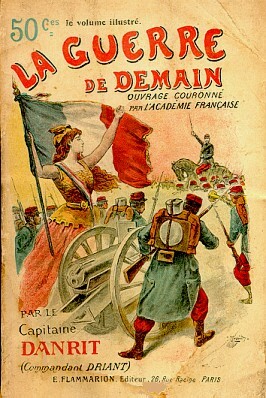 Capitaine Danrit, La Guerre des forts: Grand Récit Patriotique et Militaire (Paris: Fayard, 1900), 14. All translations from French and German have been made by the author. 6. See ``Danrit, Capitaine'' in Pierre Versins, Encyclopédie de l'Utopie...et de la Science Fiction (Lausanne: L'Age d'homme, 1972), 222-23. 7. Quoted in Paul Usherwood & Jenny Spencer-Smith, Lady Butler. Battle Artist, 1846-1933 (London: National Army Museum, 1877), 166. This survey gives an excellent acount of Lady Butler's paintings. The influence of Meissonier is examined in the chapter entitled ``The Influence of French Military Painting,'' 143-66. 8. C. De W. Willcox, ``Changes in Military Science'' in The 19th Century: A Review of Progress (London and New York: G. P. Putnam, 1901), 492-93. 9. Albert Robida, La Guerre au vingtième siecle, translated in I.F. Clarke (ed. ), The Tale of the Next Great War, 1871-1914 (Liverpool: Liverpool UP, 1995), 94. 10. Ibid., 99. My thanks to Marc Madouraud of Villiers-Adam for the illustrations. 11. B.H. Liddell Hart, History of the First World War, 1970 (London: Pan Macmillan, 1992), 28. 12. Charles Richet, Dans cent ans (Paris: Paul Ollendorff, 1892), 62-3. 13. ``Has War Become Impossible?'' in Review of Reviews: Special Supplement, xix, Jane-June, 1899, 1-16. Bloch began his study of modern warfare in 1888. The book was first published in Russia in 1897, then in France and Germany in 1898. An abridged English translation appeared in 1900: W.T.Steed (ed. ), Modern Weapons and Modern War (London: ``Review of Reviews'' Office, 1899). 14. The full, fascinating story appears in: David T. Hughes. ``The War of the Worlds in the Yellow Press,'' Journalism Quarterly, 43, 4 (Winter 1966), 639-646. 15. Garrett P. Serviss, Edison's Conquest of Mars, with an introduction by A. Langley Searles, Ph.D. (Los Angeles: Carcosa House, 1947), 16. 16. Karl Eisenhart, Die Abrechnung mit England (Munich: Lehmann, 1900), 3. 17. Publication details for these works are as follows: Louis Tracy, The Invaders (London: Pearson, 1901); William Le Queux, The Invasion of 1910 (London: E. Nash, 1906); Walter Wood, The Enemy in our Midst (London: J. Long, 1906); Robert William Cole, The Death Trap (London: Greening, 1907); August Niemann, Der Weltkrieg-Deutsche Träume (Leipzig: F.W. Bobach, 1904); Karl Bleibtreu, Die `Offensiv-Invasion' gegen England (Berlin: Schall & Rentel, 1907); F.H. Grautoff, Deutschlands Flotte im Kampf (Altona: J. Hrder, 1907).